This is the perfect example of a good thriller, there is a cohesive plot line, not too many instances where the reader has to suspend belief and characters who you feel you know. Red Ribbons is told from three main different viewpoints. Dr Kate Pearson who is a psychologist helping the police to discover the profile of a killer. A young girl was found buried in Dublin Mountains with red ribbons in her hair, soon afterwards another young girl is found, again with unknown red ribbons. Ellie Brady who is a patient in an asylum, incarcerated 14 years previously and our killer who is bored of his job, his colleagues and brooding over the recent death of his mother. As a reader there are plenty of clues to fit together, including how does Ellie’s story connect to those of the recent dead girls? The Police are battling against time to stop the killer taking any more young lives and Kate is doing her best to guide them in the right direction whilst dealing with a less than happy domestic situation. I found this book totally absorbing; one that I had to keep reading to find out how all the pieces of the puzzle would fit together. I am delighted to hear Louise Phillips has written The Doll’s House due out August 2013. 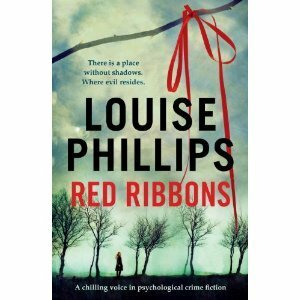 I preferred Red Ribbons – it was well crafted and really quite unnerving. The Doll’s House was good but as I mentioned the talking to dolls stuff just made be go ? ?